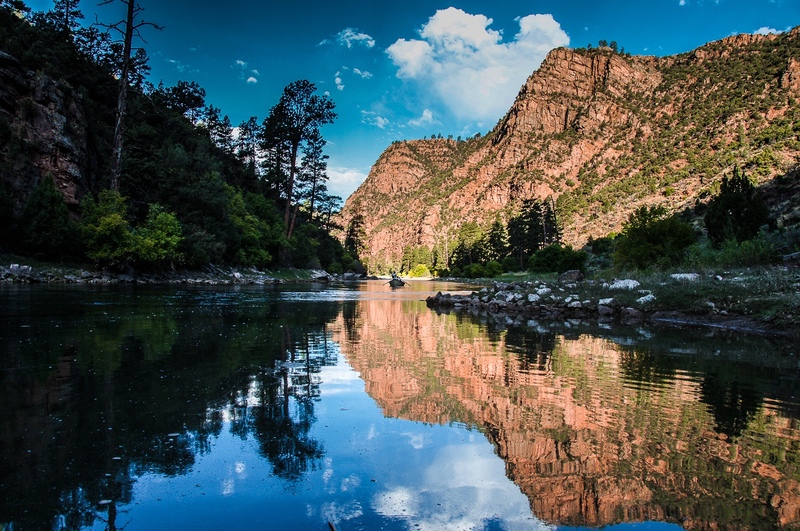 Indigo waters, colorful canyons, towering buttes, lush rivers, and forested mountains all make Flaming Gorge a treasured destination within the intermountain West. The reservoir’s 91-mile length holds hundreds of miles of diverse shoreline that run from the sub-alpine terrain of northern Utah to the high-desert plains of southwestern Wyoming. This unique National Recreation Area offers a lifetime of discovery both on and off the water. Here are a few suggestions in creating an exceptional weekend at the Gorge. One of the very best ways to experience Flaming Gorge is by water. There are many ways to enjoy an aquatic outing: boating or paddling, water skiing or wakeboarding, stand up paddleboarding, or reeling in trophy lake or brown trout. Flaming Gorge has several boat launches, developed and primitive, and three full service marinas that make accessing the water easy. Hourly boat, stand up paddleboard, and kayak rentals are available at each marina where they also offer services and supplies. Launch then explore— solitude and adventure are quickly found within this attractive environment. Time spent on the emerald waters of the Green River below the Flaming Gorge Dam is a real treat. There are reported to be over 14,000 fish per mile 0n the "A section" known as Red Canyon. This zone is the perfect place to watch osprey hunt for fish and see river otters as you cast your fly from the river trail or float your boat through this length of mellow whitewater. With the average fish caught being 15 inches long, anglers will love time spent on the Green. The alpine lakes of Browne, Sheep Creek and Spirit, found in the neighboring north slope of the Uinta Mountains, offer a cooler retreat during the warmer summer months. 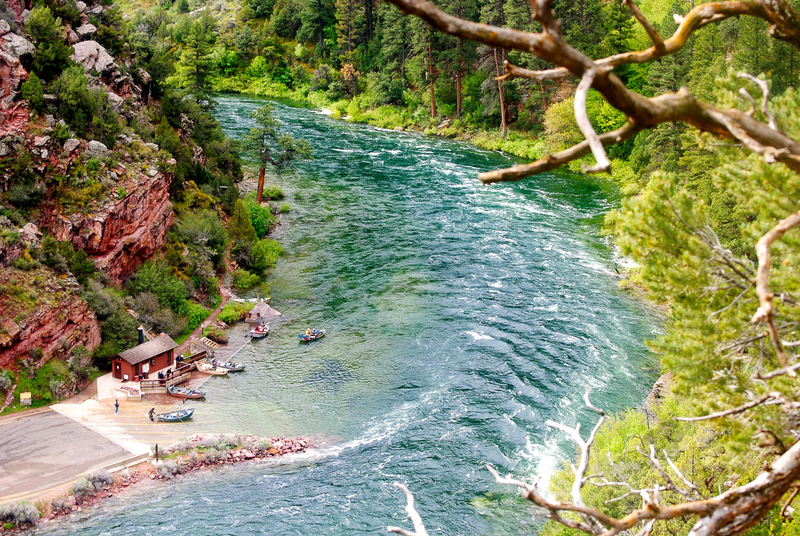 Fishing, hiking, backpacking, or viewing wildlife are all fantastic options found in the Flaming Gorge high country. This is an area that is perfect for unplugging and reconnecting with nature. Some of the best camping at Flaming Gorge can only be reached by water. There are several remote, full service sites that offer a camping experience unlike anywhere else in the west. Whether you reach them by motorboat, paddle out to them by SUP, or kayak, it makes no difference, just load up your gear and head out. Check out the sites on Kingfisher Island or in Hideout Draw. For those who prefer moving water, choose from one of 32 riverside campsites found along the banks of the Green River. These sites are located throughout a 30-mile section beginning below the dam and ending in the mountain basin of Brown’s Park. This boat/camp will require a car shuttle. Launching from the dam you will float through mellow whitewater. No permits are required for boating this section of the river, but reservations for these sites and the ones found on the lake are recommended. All camps are equipped with tables and fire rings. 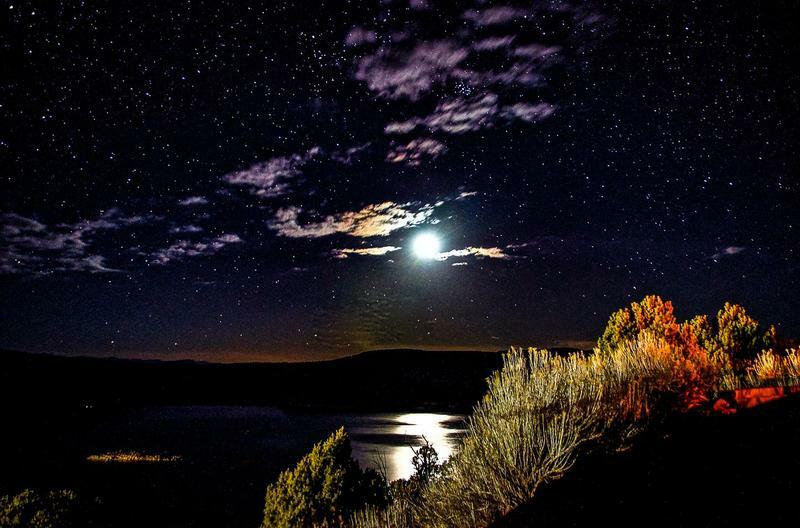 Sunrise and sunset are magical times in Flaming Gorge. During dawn and twilight, long light reflects brilliantly off the red, orange, and green in the surrounding environment. You will see how the place gets its name. This area is known for its dark night skies. Schedule your adventure for the new moon to maximize stargazing and to be wowed by the Milky Way as it paints its way across the heavens above. 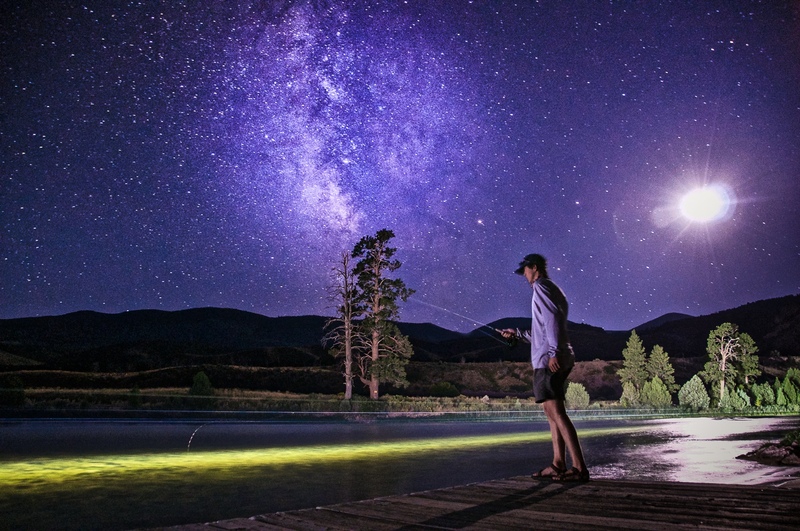 On the flipside, come during a full moon and witness your moon shadow as you cast for nocturnal fish or simply enjoy the sounds of jumping fish, frogs singing, and birds swooping overhead. If roughing it isn’t your idea of a weekend getaway don’t worry, Flaming Gorge is home to several great lodges. Rocky Ridge Outpost near Manila offers a true western experience with handcrafted cabin, yurt, and teepee rentals. They have a pond for pedal boats, swimming, and fly casting. Red Canyon Lodge is located near the edge of the scenic Red Canyon overlook and offers cabin rentals, a restaurant, Greens Lakes, a kid’s pond, horseback riding, and hiking. For a more remote retreat you can make your way to the Spirit Lake Lodge. Located in the high alpine zone of the Uinta Mountains, reaching this lodge requires a drive along a stunning scenic byway, passing peaks, creeks, streams, and lakes before arriving. Set on the banks of the pristine Spirit Lake, the lodge is home to a store, grill, and offers rustic cabins for rent. For an added bonus, schedule your getaway for the holiday weekends of July 4th and Labor Day as visitors to Flaming Gorge will be treated to festivities. July 2nd is the Freedom Festival in Dutch John. September 2 - 5 are Daggett Daze with daily events, including a fireworks show September 3rd in Manila. 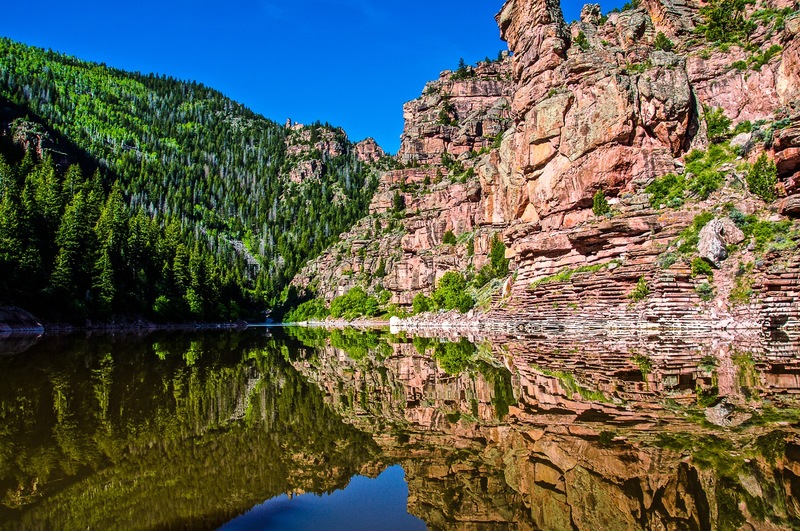 Despite being located in the center of a natural playground, Flaming Gorge is one of the least crowded destinations in the west. Folks travel from all around to revel in its wild scenery, trophy fishing, abundant boating, convenient camping, and comfortable lodging. Some come for the water sports as others come for the hiking, climbing, and biking, but all who visit will have the opportunity to find a solitude that will allow them to unplug, unwind, and truly relax. Thank you for visiting http://www.flaminggorgecountry.com/unforgetable-weekend! Be sure and revisit flaminggorgecountry.com frequently for content updates and more.